Schedule and Results: Gilas Pilipinas vs. The World - pocket tournament in Estonia (+TV Info and Live Stream) - Balita Boss! The Gilas Pilipinas, Philippine national men’s basketball team, will hold a training camp in Estonia that includes a four-nation pocket tournament. 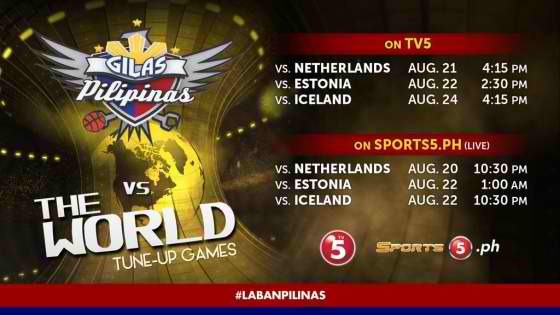 Gilas Pilipinas will play host Estonia, Iceland and the Netherlands from August 20 to August 22 as part of its preparations for the 2015 FIBA Asia Championship. Below is the schedule of 'Gilas Pilipinas vs. The World' tune-up games. Game will be shown LIVE on www.sports5.ph and a delayed telecast on TV5.